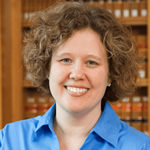 Stefanie Pearlman is a reference librarian and a Professor of Law Library at the Schmid Law Library, University of Nebraska College of Law, where she has worked since 2003. She received her B.A. from Hofstra University, her J.D. from Washington University in St. Louis, and her M.A. in Information Resources and Library Science from the University of Arizona.